Foundation Park was meant to be temporary military housing but when privatized became a concrete row housing district for the poor. Suddenly it was torn down but before that I beatified it after living there to reveal that we all are really alike yet sustenance hides that. I wanted to elevate those who lived there. These were created while living there and experiencing what it was like to live what most would say was poverty. There was a trued sense of community and equality, normal and familiar just without the frills. Yet there was also the overwhelming sense of human needs that were without pretenses melting viewers hearts with compassion. They are done in pastel and were considered by an art critic in Washington D.C. to be "Hopperesque" after Edward Hopper and to a local art critic criticized for making the place too beautiful. 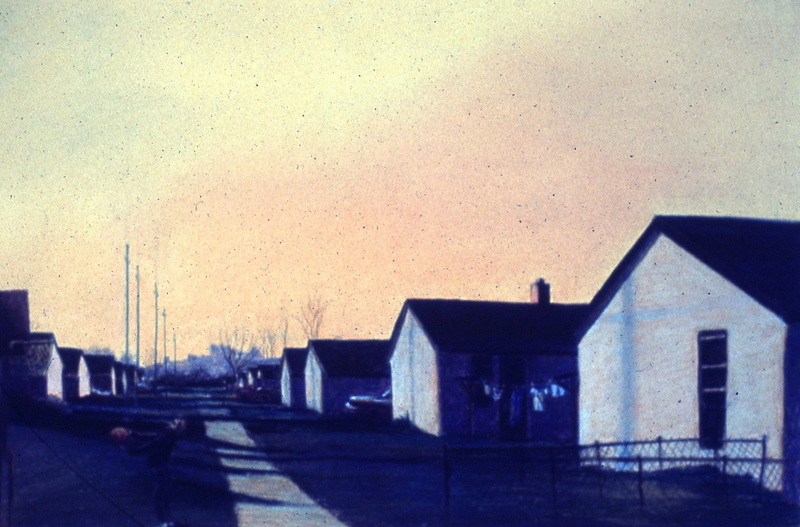 The place was torn down and replaced by government housing.